in AppleVis Podcast „Color Recognition Apps: Part 1 – ColorVisor“. Would you like to identify the colors of objects in your environment? Let ColorVisor take a look using one of the cameras of your iOS device. Would you like to analyze the colors of an image stored in your Photo Library? ColorVisor can do the job. ColorVisor not only gives you the names of the colors, it can also analyze them and provide you with information about their color components, RGB as well as HSB. ColorVisor is fully accessible with VoiceOver. Please note: Accuracy of color recognition depends on the features of the cameras of your device as well as on ambient lighting. Please note: The Color Save option has been removed in this version. Saved colors can no longer be displayed. 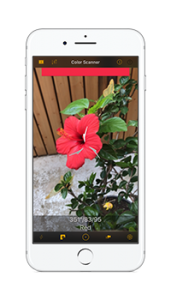 The ColorVisor runs on all iPhones, iPads, and iPod touches that provide at least one camera and that provide iOS version 10.0 or later. Please send your questions, problems, or suggestions to support@visorApps.com or use our Contactform.